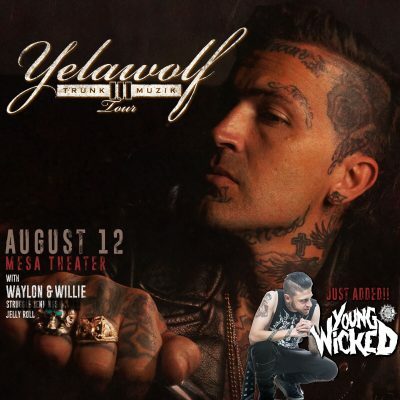 Later tonight (Sunday, August 12th), the homie Yelawolf will be headlining a show in Grand Junction, Colorado! It’s happening at the Mesa Theater, and tickets are $32-35! Yelawolf murders every stage that he touches, and with Jelly Roll, Struggle Jennings, and Young Wicked also on the bill, you’re in for a hell of a night! Get your tickets and don’t miss this show Colorado Juggalos! Damn if only I lived in Colorado. I mean, its only right he opens up for yela, they clearly got to talkin at the barber shop where they both got the same “do”. That’s one hell of a book report raven have u been taking your adderall? Otis the lotus slayer strikes again tell yela n the crew to hide ther teens or they may get impregnated maybe he’ll break up jelly n struggle so we can get a full jellyroll album ?